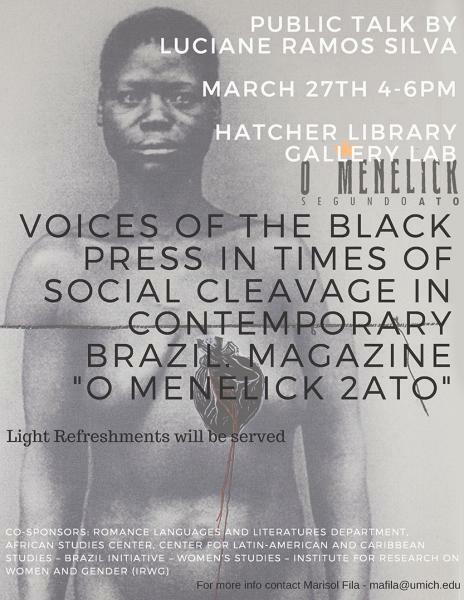 Voices of the Black Press in Times of Social Cleavage in Contemporary Brazil. Magazine "O Menelick 2Ato"
Through an overview of the digital and printed magazine O Menelick 2Ato, Luciane will discuss how the black arts in Brazil have been a fundamental channel of critical engagement in discussing the dominant aesthetic and poetic regimes of representation, which is an urgent matter in the current social and political context of Brazil. Light refreshments will be served. Free and open to the public. Luciane Ramos Silva is a dancer, independent curator, choreographer and anthropologist with a transdisciplinary background. In her formation years, she studied at centers such as University of São Paulo, University of Maryland, Ecole des Sables (Senegal), EDIT (Burkina Faso), Center Momboye (France), Bagatai Center (Guinea) , among others. She holds a PhD in Performing Arts/Dance from the University of Campinas (UNICAMP - 2018). Her dissertation research was around notions of coloniality in dance, pedagogical approaches and south-south relations through the work of the Senegalese choreographer Germaine Acogny. She also holds a MA in Social Anthropology and African Studies from the University of Campinas (UNICAMP - 2008). She is co-editor of "O Menelick2Ato," a quarterly printed magazine focused on the Black Atlantic - laureated By Prince Claus Fund Award (2018). She is also the cultural manager of Acervo África – a research and educational center for material African culture. Since 2018 she joins Anikaya Dance Theater - Company based in Boston. See below for links to her work.